James Gorzell, who lost his 15-year-old child Kali to a boating incident, delivers a powerful boating safety message to Pasadena ISD families during a press conference at Pasadena Memorial High School. When the Gorzells got to the hospital, her father had to view his daughter to make a formal identification. “She was beautiful…but gone,” he says. The couple shared their heartbreaking story during a press conference at Pasadena Memorial High School. 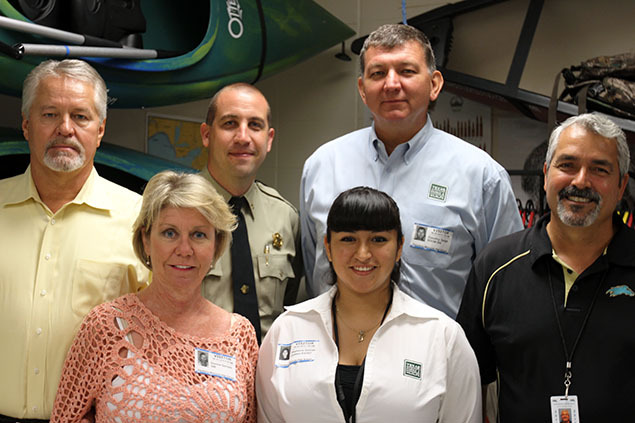 They united with Texas Parks and Recreation representatives and Coach Lloyd Love, the school’s outdoor class instructor, to educate students and parents throughout the district about boating safety before heading to the water this Labor Day Weekend. Since August 2013, more than 86 people have lost their lives on Texas waters in boating or swimming accidents worked by Texas game wardens, an unusually high number of fatalities. Last year in Texas, 146 accidents were reported by the U.S. Coast Guard, 31 of which ended with deaths. Statistics show many of these tragedies could have been prevented. The Texas Parks and Wildlife Department released an emotionally charged educational video aimed at getting a boating safety message to parents. “Beautiful But Gone”, a sequel to “Never Happens: True Stories From Texas Boaters and Swimmers,” features moving interviews with parents like Donna and James Gorzell, who lost a child in a preventable accident with the hope that sharing an important message with other parents will save lives. * Wear a life jacket. Most persons who have died in a boating accident would be alive today if they had worn a life jacket. * Use the ignition safety switch. Commonly called a "kill switch," it stops the engine if you fall overboard so you won’t be stranded, or run over by your boat. Safety is a top priority in Coach Love’s outdoor class. The class connects students to nature through environmental educational instruction and outdoor field trips. Students study boater and angler education, as well as archery. Coach Love talked to students during the press conference about his passion for teaching and the importance of boating safety. It is mandatory for anyone born on or after Sept. 1, 1993 to obtain a boater’s education certificate before they can legally operate a vessel with a rating of more than 15 horsepower. Anyone supervising the operation of a vessel by another must be 18 or older and exempt from the boater education requirement (born before 1993) or have a boater education certificate. and click on Boating and Safety.